Beauty experts consistently recommend staying out of the sun to prevent fine lines and wrinkles, but the risk of sun exposure over time is actually much more serious than just aging skin. 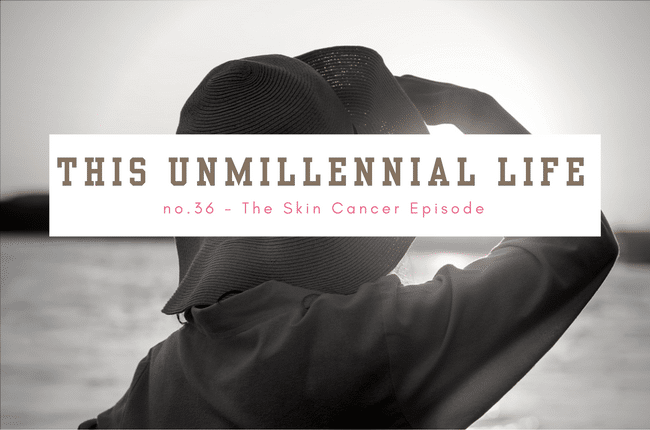 As THE most common form of cancer in the U.S., skin cancer as a real health concern for unmillennial women. Today’s podcast addresses why. How common is skin cancer for women over 40? When should women start getting yearly body checks by their dermatologist? What are the different forms of skin cancer? Are there any skin cancers that are benign? What is a woman’s risk of skin cancer if she’s ever used a tanning bed? What are the best ways to prevent skin cancer and aging skin? Are sunless tanners a safe alternative? And I close out today’s show by admitting that I do, in fact, own my own at home spray tanning system at home (<- affiliate link)… a fact I conveniently glossed over in a previous episode. I’m inviting you guys to let me know what you think — good purchase OR Regan, you’re crazy!?! As always, I hope you find this show helpful and most importantly, I hope it prompts you to make an appointment to have yourself checked by your dermatologist. That’s going on my to-do list ASAP. If you have a show idea you’d like to hear about, let me know and submit a show idea here! Or connect with me via Instagram, Tweet Me @ReganJonesRD, leave me a voicemail, email me regan[at]thisunmillenniallife[dot]com or join the This Unmillennial Life Facebook Group. Thank you for listening and sharing with a friend! And of course, thanks for subscribing. If you enjoy the show, please leave a review! And if you’ve been listening to the show for a while or are a new listener and have thoughts about what you like/don’t like, I’d love for you to share them with me through this very brief LISTENER SURVEY. Thanks for your feedback! This week’s episode is brought to you the Soyfoods Association of North America. Soy is an easy way to enjoy more plant-based foods in your diet. Visit www.soyfoods.org for more information and recipe ideas. Never miss another episode! This Unmillennial Life is available each week via iTunes, NPROne, Libsyn, and Spotify. Which retinoid OTC cream does she recommend?